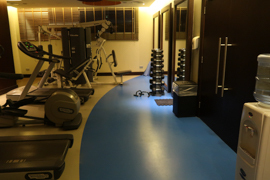 As a homebase for my trip to the Dubai Parks, I decided to go for a hotel location in Southern Dubai, so that I have easy access to the amusement park. 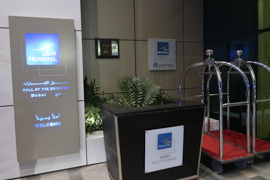 Finally, I ended up in the Novotel Suitses Dubai Mall of the Emirates, which I majorly selected due to the proximity to Sheikh Zayed Road and a very reasonable price of 1000 AED for three nights (first nate non-refundable), including breakfast buffet. 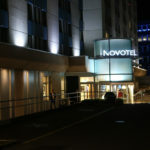 In fact, Novotel Suites Mall of the Emirates already is a twin hotel together with an ibis hotel right next to it. If you stand at the front of both hotels, you may not recognize it directly, but the floors are connected and they share the same staff and the same parking garage. It may easily happen that you are served by a person in ibis clothing at breakfast. 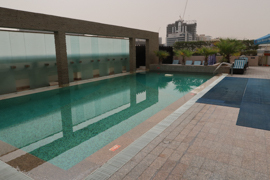 The location is very close to the Mall of the Emirates. If you dare to pass a comparably active road and take the road jungle to the backside of the famous shopping temple, you are ready to spent your money in a couple of minutes. The proximity to the Mall of the Emirates is however not fully advantageous: the Dubai traffic, which tends to have jams around the large malls, can easily delay your travel to the hotel by quite some minutes. The street in which the hotel is located is very quiet, the access to the parking garage is easy to find, though the road down to the lots is a bit of tricky. 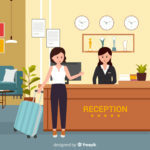 Getting from the airport to the hotel is quite easy – however, reaching the hotel from the South or getting back from the hotel to the Sheikh Zayed Road is a bit of tricky, but finally convenient. Anyway, I would recommend you to bring some sort of GPS navigation when you are in Dubai. The area of the hotel is mixed. I liked it quite much, as there are some simple restaurants and small supermarkets around – there are however also massage parlours explicitly dedicated for men around. Dubai is a capital of prostitution nowadays, but I did not see any streetworking around, so I did not bother at all and felt save. 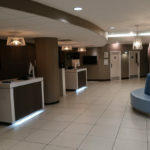 There are a lot of Accor Hotel options around. 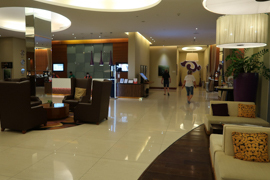 I also stayed in Novotel Al Barsha at a later time, which is very closeby. 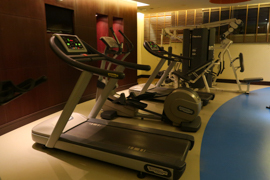 The hotel offers three different kinds of suites, all of them are designed to host up to three people. 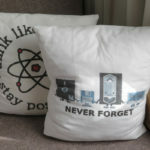 I had a double bed room which was additionally equipped with a sofa which could be turned to the third bedding. The 30sqm suite has been quite comfy and was clean and modern. Toilet (and a washing basin) were separated from the bathroom with bathtub, separate shower and another washing basin. The washing basin area there has been a bit narrow – I like to but my sanitaries around the sink. What I did not like too much that quite a lot of walls of the room were not rectangular: for example, the door area of the toilet was much narrower than the wall to which the toilet has been mounted. Vice versa, the shower has been narrower than the shower door. There has been a working desk – however, you needed to take the chair from the table to work. In general, this area felt narrow as well, but did its job for me. The bed and sofa area was very spacy, though, and the TV set had a very nice size. In contrast to European Novotel Suites, there is no cooking facility at all in this brand in the U.A.E. I did expect at least a microwave and a free fridge, but only the minibar offered cool drinks. The hotel filled up the room with complimentary water bottles. However, the system was quite strange: I consumed the two bottles on the first day I have been provided. 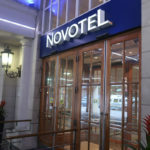 When I came back on the seciond day, there have been three new bottles, Novotel branded. I did not drink them at all, but nevertheless, the next maiden replaced it by four bottles, ibis branding (!). Overall, the room service was fine, as expected in the Arabian area. From my former stay in the ibis sister hotel, I had quite high expectations on the buffet breakfast in Dubai. I love to have breakfast in an Emirates hotel, just as so many cultures are meeting there. You can typically have a croissant or scrambled eggs as well as noodles or an Indian breakfast curry. The Novotel did offer it, but it felt quite limited to me compared to other places, maybe also / just due to the limited room around the buffet. Fried eggs were available from the buffet, other egg dishes were done on demand. Sometimes, the service was a bit hard to catch (typically, when you wanted to have some more coffee or tea water…). Not a bad performance by the hotel at all – I just liked other similar-category places more. 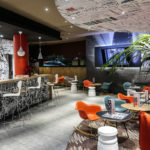 As mentioned above, Novotel Suites Mall of the Emirates and the nextby ibis share one parking garage, which is free of charge and easy to open with your room key. In the garage, there are separate entry areas to the hotel. The garage is a bit dusty and has also been a bit smelly one eveing, but overall, it has been very comfortable to park there. Even if it felt not too large, I even got a parking lot in late hours. On the rooftop, the hotel offers a nicely equipped small gym and a nice hotel pool area with a bar, from where you can also spot the tops of the more posh (and much more expansive) Kempinski Hotel. I did not use that area, but liked it very much. Gym was 24 hours, while the pool was serviced 8am to 8pm. The hotel room offered all standard services like room service or laundry. You even had an iron and a board to iron your clothing. The quality of the Wifi has been sufficent. 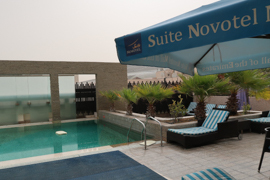 My three-day stay in the Novotel Suites Mall of the Emirates has been absolutely reasonable to good. 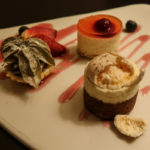 The staff was very kind, the location suited my needs, so that I have been absolutely happy with it, especially due to a quite reasonable value for money.